Home > News & Blogs > Child Abuse > President for 100 days (so far)! President for 100 days (so far)! 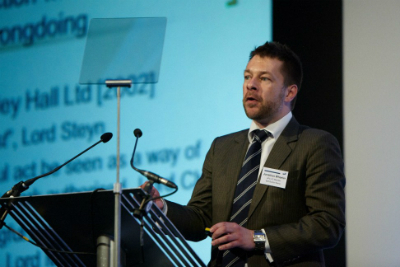 In the second of two blogs, Jonathan Wheeler writes about the first days of his APIL presidency, focussing on APIL’s positive agenda for change. APIL is first and foremost a campaigning organisation. 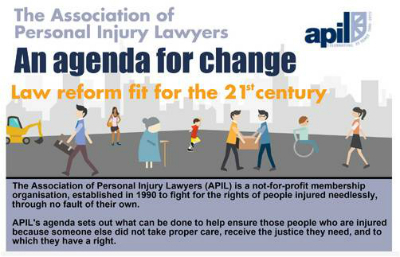 As president, I take a lead on many of our major initiatives to improve the law for the thousands of injured people our members represent. We continue to promote full and fair compensation for injured people and their families. Statutory compensation for a loved one who is killed as a result of someone else’s negligence is appallingly low in this country at £12,980. It makes no sense that these are so low – that it’s cheaper to kill than to maim someone – and we ask why should such damages be tightly restricted to parents of a child under 18, or a spouse. Public surveys have expressed huge dissatisfaction with the current state of affairs and we have secured the support of MP’s to change the law. The Scottish system is much fairer and we call for this to be adopted south of the border. People who have been traumatised by the death or serious injury of a loved one are also short changed by the current system, which was developed 26 years ago in the aftermath of the dreadful Hillsborough disaster but is now out of date. Restrictions on who can claim, and how they receive the news do not reflect modern society with its 24 hour news feeds, mobile phones and internet access. This too must be dealt with at the highest level to give effect to the Law Commission’s recommendations voiced over 10 years ago which are in line with ours. APIL is the only organisation which is constantly pushing the Government to do something about this, and we are holding a Parliamentary event in November to highlight these issues. To make public liability compulsory is another campaign idea which came out of my speech on taking up office in April. It is already compulsory if you are an employer to have insurance to cover your liabilities to employees who may be injured or harmed when at work. It makes no sense that members of the public do not have similar protection when they are dealing with public facing businesses. APIL members have represented clients who have sustained injury and harm as a result of the negligence of a business, or a landowner, and have been unable to recover compensation because of a lack of insurance. In some cases rogue businesses just shut up shop to avoid paying out on a claim, only to set up again down the road with apparent impunity under a different name. Why should the tax payer foot the bill in such situations (through NHS treatment and welfare benefits for the injured) when the responsible party should pay? It makes sense for well run businesses to have this cover to avoid a financial meltdown should they be found to have been negligent, and it will also drive up safety standards because businesses with a bad attitude to risk will not be able to get insurance or the costs will be prohibitive. This is what we want – these rogue businesses off our streets! Campaigns such as this one are not won over night but we are busy getting together case studies which illustrate the injustice caused by the current status quo and will be engaging with politicians and opinion formers to consider enacting legislation to bring this to effect. We know that the NHS is under-funded, with reports of a £2 billion black hole to fill. We at APIL are considering imaginative ways of plugging this gap. Allowing the NHS to reclaim more of the cost of treatment given to those injured by the fault of another is one way of doing this. There is an old saying in legal circles that it is fair and just for the polluter to pay. Again why should the hard working tax payer (to borrow a much over used phrase by some of our politicians) stump up for treatment through the NHS when someone has carelessly, recklessly or deliberately caused harm which has necessitated such treatment? Why shouldn’t the polluter pay? We are developing this proposal as I write this. I really feel I have already achieved something in my presidential year. Support for vulnerable witnesses was very much on my agenda when I took office. In my day job I represent survivors of child abuse in compensation claims. It will come as no surprise that my clients are often damaged individuals, having lived with the effects of their abuse for many years. Bolt Burdon Kemp also represent other people – seriously injured in traffic accidents and through medical negligence for example – and again through their experiences they are likely to be vulnerable. In our adversarial court system, litigating a case on behalf of our clients to obtain their rightful compensation can take its toll on our clients and however much we act to limit their anxiety and stress, it can still surface, not least when our clients have to give evidence in court. I helped set up a working group under the auspices of an organisation called The Advocate’s Gateway to look at ways vulnerable witnesses in civil law cases can be supported in the court process to give their best evidence. Borrowing from the practice of the family and criminal courts, identifying vulnerability at an early stage is key. The courts can then use their case management powers to mould the hearing to address the very needs of the party giving evidence – so perhaps through interpreters, giving evidence behind a screen or in a different place by video link, giving evidence away from the trial, or having someone in court to represent their interests (called a registered intermediary). Ground rules hearings and control of the questioning of the advocates also comes into this. Our civil justice toolkit was published last month and we now need to get the support of the senior judiciary to recognise its effectiveness and put our recommendations into practice. It pains me that the very system I use to secure compensation for my clients, allowing them to get their lives back on track, can cause them more hurt than they have already experienced. Our justice system must remain robust, but it must not be abusive. I hope our toolkit will go some way to allow vulnerable witnesses give their best evidence. I hope this has given a flavour of some of the major campaigns we are running, and the progressive agenda APIL is putting forward. There’s a lot to do to keep up the momentum and to achieve some positive results. I appreciate that that may not happen during the course of my presidency and it will be for others to help progress, shape and change the agenda going forward. But I am not giving up yet – I still have 265 days to go! So I’d better get on with it! I am a Partner at Bolt Burdon Kemp specialising in Child Abuse claims. If you think you may have a claim, contact me free of charge and in confidence on 020 7288 4837 or at jonathanwheeler@boltburdonkemp.co.uk for specialist legal advice. Alternatively, you can complete this form and one of the solicitors in the Child Abuse team will contact you. You can find out more about the team.